Gordon Elliott will keep a close eye on the weather at Newcastle throughout this week, ahead of Samcro's planned outing in the Fighting Fifth Hurdle on Saturday. The six-year-old carried all before him as a novice last term, but he suffered a surprise defeat on his return at Down Royal and was taken out of last week's Morgiana Hurdle because of the good ground at Punchestown. Elliott quickly nominated the Newcastle Grade One sponsored by Betvictor - and a possible clash with reigning Champion Hurdler Buveur D'Air - as a likely port of call, but he would like to see a bit more rain at Gosforth Park. "Samcro did a nice piece of work on Friday and the plan is still the Fighting Fifth. We just need a bit of rain over there now," he said. The Newcastle ground was reported to be good to soft yesterday after 40mm of rain at the track over the last week. Nicky Henderson's evergreen My Tent Or Yours is on track to defend his International Hurdle title for JP McManus at Cheltenham next month. The 11-year-old, a three-time Champion Hurdle runner-up, returned to Prestbury Park 12 months ago to become the joint-oldest winner of the International. 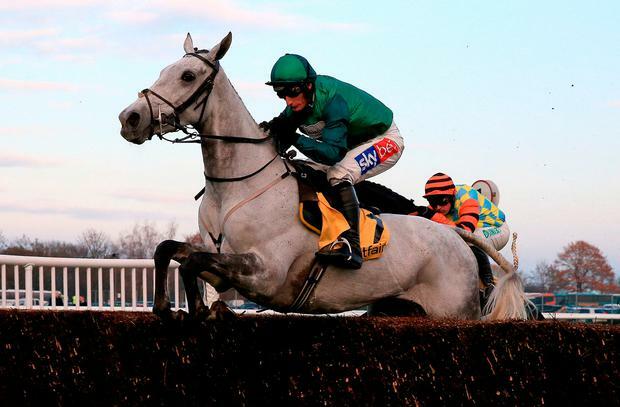 Meanwhile Bristol De Mai is likely to head for the King George at Kempton after bouncing back to his best to win Saturday's Betfair Chase at Haydock for the second successive year, as he turned in a superb round of jumping for Daryl Jacob. The 13/2 shot held the challenge of Colin Tizzard's Native River in game fashion, with Thistlecrack in third, but evens favourite Might Bite weakened into last place. Jacob said: "We've believed in this horse a long time. That was a big moment. He's a great horse. It obviously was a disadvantage it not being soft ground, but at this track, there's something about it he just loves." Bristol De Mai could be joined in the King George VI Chase at Kempton by Thistlecrack and possibly Native River. "They both ran right up to their best on this track," said Tizzard. "Thistlecrack has been off for a year and everyone was writing him off. He has done his job. I'm sure he'll go to the King George. "We're just trying to win the Gold Cup with Native River again. He'll be better if he ran more often, so he might go to the King George."